Every month, I have a special discount, vendor or restaurant voucher that will be given to a couple upon booking a wedding. I will offer you a dealto save you some money on engagements or portraits. It may be possible for me to photograph the bride and groom at their wedding night stay after the reception. For May through October, I am working together with Keebee Bed & Breakfast in offering a Wedding-Honeymoon (Elopment) Package. This package includes having your wedding and reception on the grounds at only $50 hr. There are (6) beautiful and comfortable rooms to choose from for your honeymoon night and day stay.​ A wedding cake can be added for the reception if the couple does not already have a cake ordered. My photography of the wedding and reception will be only $75 hr. instead of $100 hr. A personalized package of enlargements OR DVD OR a variety of photo album sizes to choose from. 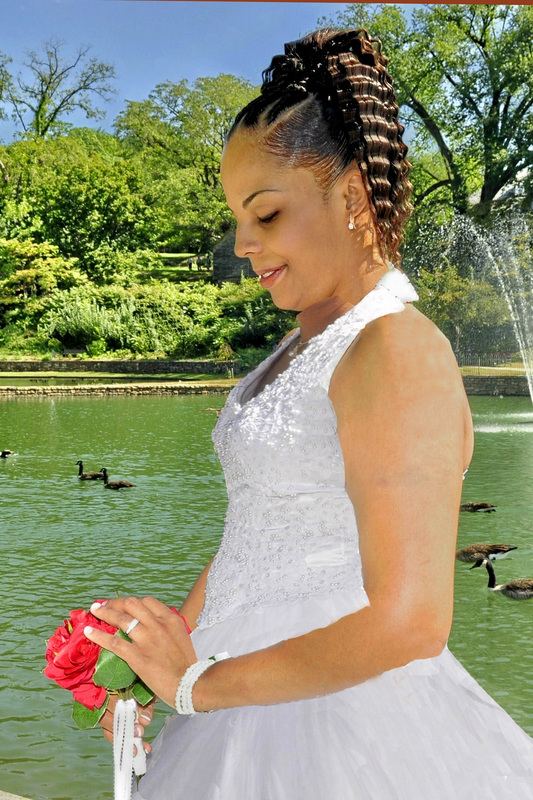 SEE WEDDING-HONEYMOON-PHOTOGRAPHY PACKAGE on separate page on this website. ​​ Personalized packages were created based on 30 years of experience talking with couples to find out what they really want with their wedding photos or what married couples wished they had had with their wedding photos. Most people want every aspect of the wedding experience photographed. They want good quality pictures (not the kind from those little throw-away cameras!) of the bridal shower, the rehearsal, the rehearsal dinner, pictures at their house the day of the ceremony, the reception, the dancing and yes of course, the wedding ceremony! Weddings take months of planning and preparation. People want to be able to look back and see the fruit of all their labor. There are so many things that go on that the Bride or Groom would never see unless it was photographed. That's what I do. It's something to really enjoy later. My style of wedding photography captures the entire history of the event. The way your proof book will be laid out will essentially take you on a tour of your wedding experience from beginning to end. You will see many things that will bring you joy. Things you could not see while preparing to walk down the aisle. Every single picture that I take is examined and customized through photo editing software to ensure that it looks great when the final product is delivered. You will receive a minimum of 200 pictures for your wedding album. A smaller album can be organized for the bride and groom's family of approx. 115 photos. My wedding costs price range from $700 to $1,000 . It is based on travel, total hours, how many photo albums, enlargements and bridal portraits. Due to financially stressed couples, I can assist them with a payment plan. after the initial small down-payment. Also, I can consult with venues, caterers, florists, entertainment, wedding directors and more to assist you in saving money and to evaluate your needs for your wedding. Don't get stressed out with all these issues alone, let me help. ALL VISITORS - PLEASE GO TO CONTACT PAGE AND SUBMIT YOUR WEDDING INFORMATION AND INQUIRIES. ​I will contact you to soon to discuss details and quote.